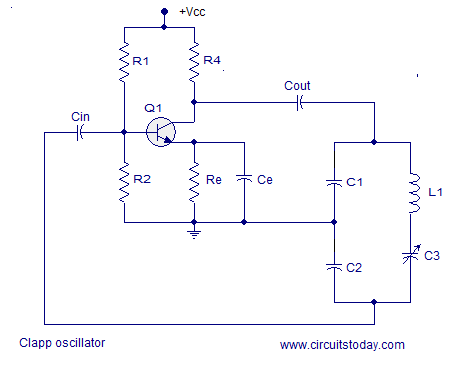 An oscillator is used to produce electronic signal with oscillating periods. Eg: Sine wave, square wave etc.. Oscillators are broadly classified into two – linear oscillators and non-linear oscillators. As the name implies, linear oscillators are used to produce linear or sinusiodal waveforms. Whereas, non-linear oscillators are used to produce non-linear (non-sinusoidal output waveforms). All types of electronic oscillators use their input voltage to control the oscillation frequency. Linear oscillators are of many types like Negative Resistance Oscillators, Wien Bridge Oscillators, Phase Shift Oscillators (Transistors and FET)., and so on. 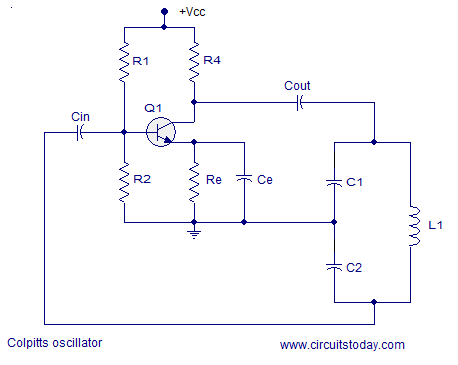 Colpitts Oscillator is an electronic oscillator which uses an inductor and capacitors to form an LC oscillator circuit. 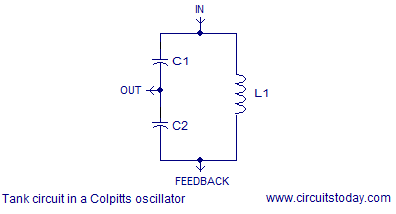 Colpitts oscillator was invented by American scientist Edwin Colpitts in 1918. It is another type of sinusoidal LC oscillator and is basically a harmonic oscillator, which has a lot of applications. 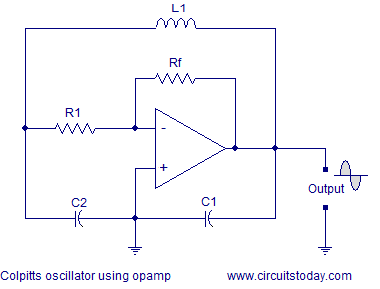 The Colpitts oscillator can be realized using valves, transistors, FETs or op-amp. Â It is much similar to the Hartley oscillator except the addition of tank circuit. In Colpitts oscillator the tank circuit consists of two capacitors in series and an inductor connected in parallel to the serial combination. The frequency of the oscillations are determined by the value of the capacitors and inductor in the tank circuit. Thus the main difference between a Colpitts Oscillator and a Hartley Oscillator is that the former uses tapped capacitance, while the latter uses tapped inductance. Colpitts oscillator is generally used in RF applications and the typical operating range is 20KHz to 300MHz. In Colpitts oscillator, the capacitive voltage divider setup in the tank circuit works as the feed back source and this arrangement gives better frequency stability when compared to the Hartley oscillator which uses an inductive voltage divider setup for feedback. The circuit diagram of a typical Colpitts oscillator using transistor is shown in the figure below. In the circuit diagram resistors R1 and R2 gives a voltage divider biasing to the transistor. Resistor R4 limits the collector current of the transistor. Cin is the input DC decoupling capacitor while Cout is the output decoupling capacitor. Re is the emitter resistor and its meant for thermal stability. Ce is the emitter by-pass capacitor. Job of the emitter by-pass capacitor is to by-pass the amplified AC signals from dropping across Re. The the emitter by-pass capacitor is not there, the amplified AC signal will drop across Re and it will alter the DC biasing conditions of the transistor and the result will be reduced gain. Capacitors C1, C2 and inductor L1 forms the tank circuit. Feedback to the base of transistor is taken from the junction of Capacitor C2 and inductor L1 in the tank circuit. Â When power supply is switched ON, capacitors Â C1 and C2 starts charging. When they are fully charged they starts discharging through the inductor L1. When the capacitors are fully discharged, the electrostatic energy stored in the capacitors gets transferred to the inductor as magnetic flux. The the inductor starts discharging and capacitors gets charged again. This transfer of energy back and forth between capacitors and inductor is the basis of oscillation. Voltage across C2 is phase opposite to that of the voltage across the C1 and it is the voltage across C2 that is fed back to the transistor. The feedback signal at the base base of transistor appears in the amplified form across the collector and emitter of the transistor. The energy lost in the tank circuit is compensated by the transistor and the oscillations are sustained. The tank circuit produces 180Â° phase shift and the transistor itself produces another 180Â° phase shift. That means the input and output are in phase and it is a necessary condition of positive feedback for maintaining sustained oscillations. The frequency of oscillations of the Colpitts oscillator can be determined using the equation below. Where L is the inductance of the inductor in the tank circuit and C is the effective capacitance of the capacitors in the tank circuit. If C1 and C2 are the individual capacitance, then the effective capacitance of the serial combination C= (C1C2)/(C1+C2). By using ganged variable capacitors in place of C1 and C2, the Colpitts oscillator can be made variable. Main advantage of Colpitts oscillator over Hartley oscillator is the improved performance in the high frequency region. This is because the capacitors provide a low reactance path for the high frequency signals and thus the output signals in the high frequency domain will be more sinusoidal. Due to the excellent performance in the high frequency region, the Colpitts oscillator can be even used in microwave applications. The circuit diagram of a Colpitts oscillator using opamp is shown in the figure above. The opamp is arranged in the inverting mode where R1 is the input resistor and Rf is the feedback resistor. The gain of the opamp based oscillator can be individually set using the components Rf and R1 and it is a great advantage. The gain of an inverting op-amp amplifer is given by the equation; Â A = -Rf/R1. Other components such as the tank circuit elements, coupling capacitors etc have no significant effect in the gain of an opamp based Colpitts oscillator. In transistor based versions, the gain is dependent on almost all components (especially the tank circuit) and it is difficult to have a prediction. The working principle and theory of operation of the opamp based Colpitts oscillator is similar to that of the transistorized version. The equation for frequency is also the same. Applicable to obtain periodic output signals of high frequency. Colpitts Oscillator using surface acoustic wave devices can be used to produce useful sensors like temperature sensors and audio sensors. Applicable in circuits where a huge frequency range is used. Finds vast applications in mobile communications and radio forecasting. Clap oscillator is just a modification of Colpitts oscillator. The only difference is that there is one additional capacitor connected in series to the inductor in the tank circuit. The circuit diagram of a typical Clapp oscillator is shown in the figure below. Please I need a colpitts oscillator for 1ghz frequency with 12-20dbm power output using opamp, pls help me.